A little over a year ago I got my first motorcycle. Since then I have developed a deep love for this machine. I take a lot of heat for riding with no helmet, but until you’ve felt the wind and smelled the aromas you cannot understand what I understand. But that’s beside the point. The big, strong smells I that come to me while riding. The smell of fresh cut grass, freshly bloomed flowers, spilled fuel, dead animals, and the list goes on. The variety and beauty is incredible… and something you cannot experience in a car. The feel and the sound of the wind whipping through my hair and screaming in my ears. Oh it’s cold and loud sometimes but it’s invigorating and something you cannot know in its fullness while riding in a car. The intoxicating feeling of dancing with death while you barrel along knowing that if something should happen there is nothing between you and the road but imagination! There is something exhilarating about knowing the only thing between you and death is your driving skill (and the hand of God). The feel of a lady holding tightly to me. This lady is my bride or one of my daughters. The squeeze is filled with terror and confidence. Terror as the speed increases and confidence as they realize to whom they are clinging. This is something that an automobile driver will never experience. The unspoken language spoken by bike riders as they pass one another and ride together. It is a solidarity signified by a subtle wave or slight tip of the head. It is a beautiful and strong thing that automobile drivers do not share. The peace. It’s true… bike riders experience a peace that belongs to the wind that whips through our hair and whistles in our ears. It avoids those who ride in cars for it knows… those who ride bikes need me. We get exactly what you mean!!! 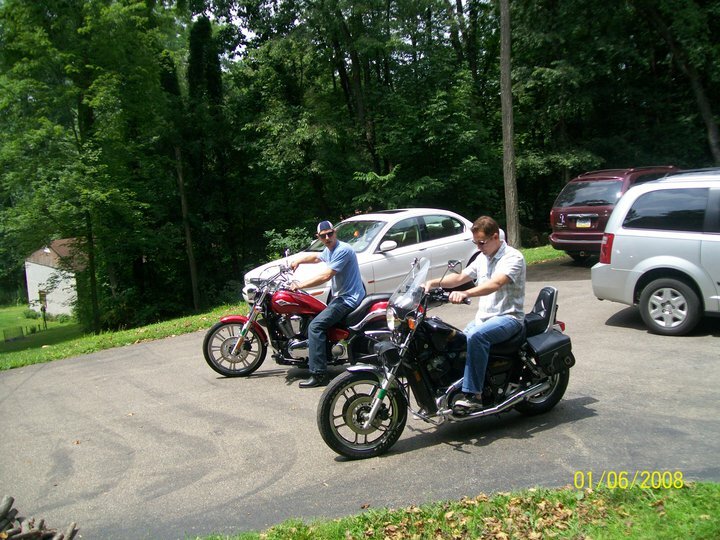 Mark on his ’12 Roadking and myself on my ’82 Shovehead! !